The Crayola Story Studio Star Wars edition allows your youngling to put themselves in the boots of a true Jedi Padawan. The kit comes with enough materials to make three books. With each story being around 12 pages, I discovered that my son doesn’t have the attention span to finish even one complete book. When you first open your story studio kit, be careful not to throw anything away. The kit includes a set of markers, three binding strips, glossy paper, regular printer paper and a story studio code. The glossy paper is for the full color cover and the regular paper is to print the coloring pages. Keep the code in a safe place because you will need it to register and design your book. In order to get your personalized story, the first thing you have to do is go to Crayola’s story studio website and follow the directions to set up an account.You will need the code as part of the setup. The process was very simple and easy to follow. The fun begins when you get to start making your character. You’re given the option to either create your character from scratch or upload a picture and get it characterized through the site. After you have your character designed, you are ready to select your story. For the Star Wars edition, crayola offers six different story options. My son chose to go with “Racing the Dark Side”. In addition to printing your book, you are also given the choice to download the book in a PDF version. I suggest you take advantage of this feature in the event you need to reprint pages that get messed up while coloring. Personally, I prefer Crayola’s Twistable Erasable crayons over the markers that come in the kit. The twistable crayons are easier and less messy for my son to handle. It took us a few days (and a few reprinted pages), but we finally finished our book! 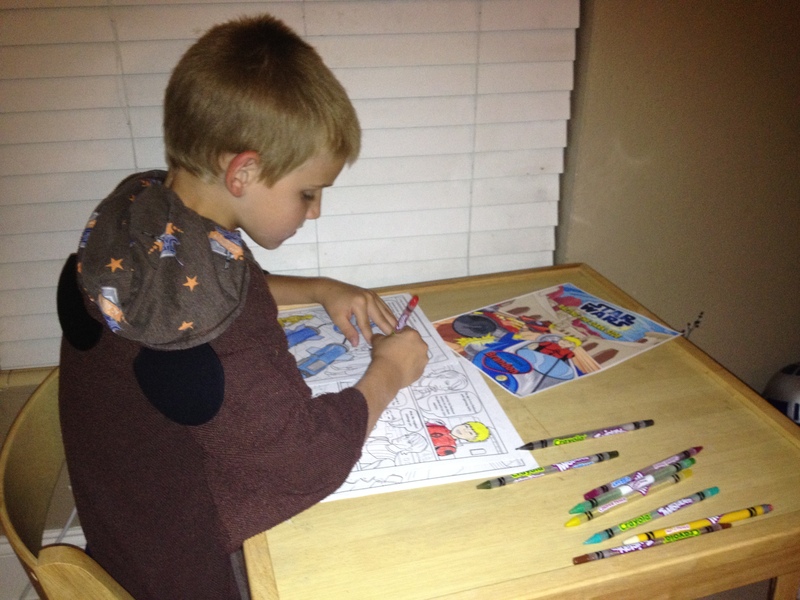 My son had a lot of fun coloring his story and I enjoyed spending some mommy and me time with him. ← Kitchen Experiments: What Flour Makes The Best Biscuits?